Healing is a return to wholeness or wellness and involves the energies and actions of curing, restoration, and transformation. However, healing does not always mean that the person gets immediately better. Sometimes healing produces a worsening of the condition before it is alleviated, and can even result in a quickening towards death, if that is the will of the persons soul. This is because the elements that caused the "disease" must be fleshed out and brought to the conscious mind before true restoration can occur. Healing follows a pattern of tension, crisis, and emergencethe worsening effect is exemplified by the "crisis" and the restoration aspect by the "emergence." Health or wellness is the clean interplay of energies and the right interplay of forces. Health is also the result of the free interplay of energy between the etheric body and the physical body, which works through the seven chakras or energy centers, the endocrine system with its seven major gland groups, and the nervous system. Health occurs when the building energies of the soul are active and disease occurs when the builders or devas of the lower centers are in control and when there is an over or under stimulation of the chakras. All disease (dis-ease) is caused by a lack of harmonya disharmony that exists between the form (body) aspect and the life (spirit) aspect. The soul, which is the union of the form and life aspect, expresses this lack of alignment, and all disease could be said to be the product of inhibited soul life. When the life of the soul is expressed, and there is harmony between higher and lower self, subjective and objective reality, and energy flows unimpeded and through right channels to its related gland, then the body responds and ill health disappears. Most causes of diseases arise from our astral and etheric bodies because these are where most of humanity is focused. Disease is the product of three influencesthe persons past life karma, their inherited karma and that which is shared with humanity, and the karma that their soul imposes on them. Disease is ultimately a process of liberationthat which frees what are static, crystallized, concretized thoughtforms that result in tumors, cancers, and the like. A shift in the inner attention of the person being healed can produce freedom from physical ills, or an intensification of those reactions which result in death, disease, or discomfort in the healing process. There is much that we can ourselves do for our own healing. Physical vitality and wellbeing begin with our willingness to be responsible for ourselvesour thoughts, feelings, and actions, which are exemplified by the basic metaphysical premise that form follows thought. If our thoughts and feelings are disharmonious, then our bodies will reflect those states of disharmony and become diseased. Our outer reality is a reflection or mirror of our inner state. The Buddha knew this truth and taught his followers the Middle Wayneither to be attracted nor repulsed by anything in life. Because of their adherence to the Middle Way, Buddhists embody vitality and well being. Integral to our good health is the development of a Witness. It is difficult to be responsible for ourselves and our health without one. We must become ever watchful of our negative thoughts and emotions and nip them in the bud to prevent diseaseand to do this, we need a strong witness. The Witness is our neutral observer, the part of us that observes events truthfully and impartially. The Witness lives in our core (the pillar of divine light that connects all of our chakras, the Sushumna), mainly in the head and heart centers, and is undeveloped in the average person. So if you want better health and wellbeing, begin now by invoking your Witness. Several times a day ask your Witness to come forth, be with you in each moment, witness your internal states, and inform you of them. Diligently watch your thoughts. When negative thoughts and emotions arise, replace them with opposite thoughts or thoughts of harmony, peace, joy. The choice is yours, and the power is within you. Magnetic healing involves the manipulation of chi energy or prana on a persons body through the use of the hands. 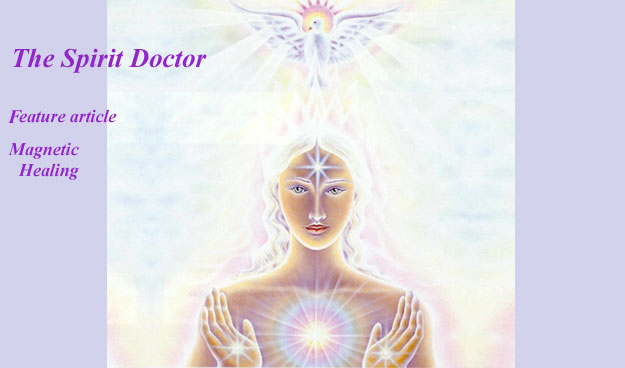 The healer uses their etheric body as a channel for the soul to transmit vital pranic force into the etheric and physical body of the person being healed. Magnetic healing works best on the lower three chakras and generally on less spiritually developed people, but can be used on any part of the body. There are many forms of magnetic healing, and the one presented here is a simple form anyone can do provided they have a good hookup to their soul, and the desire to heal. Feel the earth beneath your feet. Now create a white cord of energy that goes from the base of your spine up through the top of your head to your soul (1 to 3 feet above your head). Breathe deeply. Good. Feel the connection to your soul and the earth, and be in this present moment. Pull all of your energy into the core or Sushumna (the white pillar of light that runs through the middle of the body, about 6 inches in front of the spine), and center your consciousness in the head center (a point straight back into your head from your eyebrows, and straight below the soft spot on the top of your head). Be a clear, unobstructed channel for your soul. Visualize yourself inside the core (the white neon tube that goes from the top of your head down to the base of your spine). Be the core, and see yourself as a clear channel between heaven and earth. Get permission for the healing from the person. Your soul, their soul and personality need to be in agreement about the healing. Mentally ask them if they would like a healing. Get a sense energetically if they want the healing. If not, it may not be the right time for the healing. Test the polarity between you and the person being healed. Put your hand on their right shoulder and see whether the energy between you and the person feels okay. If not, try putting your hand on their left shoulder and see if that side feels better. Changing sides with the person changes the communication between the two of you. Link up to your soul from your head center and draw the soul energy down into the heart center, and then into the brain. Run an energy triangle of white light three times from your soul to heart to brain. That is, imagine a pillar of light from 3 feet above your head connecting to your heart in the front of the body and then going into the center of the brain. Note: the center of the brain is back from the center of the heart in front, forming a triangle. After making the three passes, make an energy link from the brain to both of your hands. Now you have created a closed triangle between your soul and heart and brain, and an open triangle between your brain and hands. Go to the top of your head and with your will, open your crown and heart chakras simultaneously. Say a prayer and invoke your soul to come down through your centers into your hands and heal the person. Put your hands on the person's distressed area or chakra, and let the energy from your soul come down into your hands and heal the person. Let your soul direct the healing. Sometimes your hands will move, taking energy out or putting energy in, or even moving to another place in the body. What you are dealing with is an over stimulation or under stimulation of a center. Your soul may guide you to use a color or sound on that area. You may pick up a color or sound through your hands. If so, ask the persons soul, "how do we deal with this?" Then respond. Hold your hands in the position as long as you can or until the energy stops running out of your hands. Say your name three times into each of your seven chakras and find three physical differences between you and the person being healed. Run a violet and white energy down your front channel and then up the Sushumna. Say anything your soul guides you to say to the person. Magnetic healing may be temporary because of polarized energy. Please email your questions on healing. And these may be answered in this column soon. Kristina Lentz has been involved in the healing arts for over 35 years and has been a professional massage therapist since 1991.